A family has closure on Memorial Day after a missing World War II bomber lost at sea nearly 75 years ago. was discovered near Papua New Guinea thanks to a Scripps Oceanographer and his team. Scott Althaus keeps a replica of the B-24 bomber which became the final resting place for his cousin during World War II. "This was done by a professional model builder in Camarillo," Althaus said via Skype from Illinois. Lt. Tom Kelly was the bombardier on the crew "Heaven Can Wait." They were part of the famous squadron known as the "Jolly Rogers." On March 11, 1944, while on a mission to bomb Japanese anti-aircraft batteries around Hansa bay in the South Pacific, the 11 person crew was shot down by enemy fire. "My family had been involved in what was then a four-year research project," Althaus said. They gave that research to Project Recover . 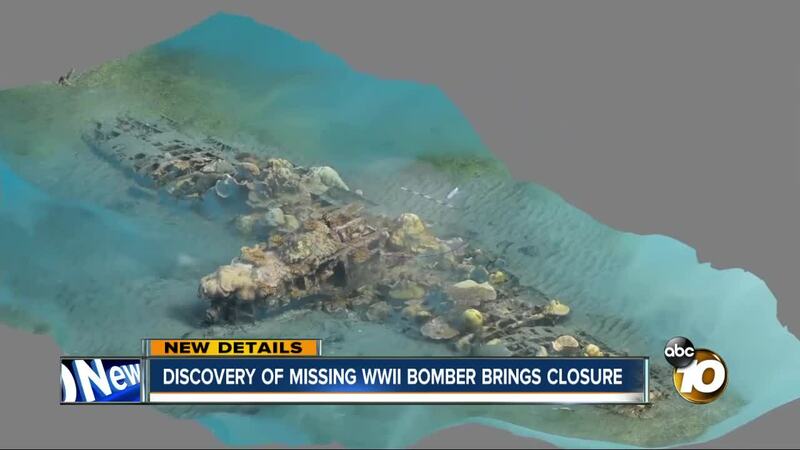 The group of marine scientists, archeologists, and historians went to work using science and advanced technology to find missing aircraft with servicemen still onboard. In October 2017, Terrill and his team set out on a three-week expedition. "These robots allow us to do very detailed surveys of the seabed using scanning sonar," he said. After 11 days on the water covering roughly six thousand acres and talking to fishermen, they found the wreckage. "It was a mixture of elation and sadness," he said. "It's very humbling knowing this is really a grave site of historical importance." Althaus' cousin was no longer just a name and a face in black and white. "For the first time in 74 years, we've seen what his grave looks like and that is a priceless gift," Althaus said. Today, there are still more than 72,000 missing U.S. service members from WWII. "There are stories like this all around the country of an uncle or a father or a grandfather that never returned home," Terrill said. "It's remarkable to think that [families] carry this loss for that many decades and then to actually see it play out is just amazing." Lieutenant Kelly's family has already been in contact with the families of seven other crew members on the plane. They're hoping the military will recover the remains from the wreckage.